All about us . . .
Hurst Morris People's controversial creation in February 1989 caused opposition, criticism and even outrage, we're quite happy to relate. The side, affectionately known as HuMP, was formed by Tim and Chris Taylor of Hurst village. All those years later we're still here, thriving, and with Chris still one of our dancers. Tim and Chris wanted to dance the Cotswold style of morris dancing together but couldn't find a mixed local side. So they decided to set up a group for both men and women. "With few mixed teams at the time, we had opposition and criticism," said Tim. "We aimed for something new and open in its outlook. All this was considered quite outrageous." HuMP has gone on to grow, happily creating outrage and loads of enjoyment for its own performers and their audiences. Join in with us as we celebrate our creation when we dance out this year. Dances Cotswold morris with sticks or hankies. Looks particularly fresh and lively in: white shirt and trousers or skirt, with two tone blue baldricks (bands crossed over the chest) or apron. Has a fool (funny man) who spouts truly amusing rhyming couplets. Offers you fabulous home-made cake. HuMP are passionate about keeping the ancient tradition of Morris dancing rooted in the community. We perform around our Hurst village base, near Reading, and in Berkshire and its nearby counties. We dance at village and church fetes and events like Hurst Show and Country Fair and Henley Show. We also perform at old folks' homes, harvest suppers and mencap clubs. BUT 'We have hankies, and love to travel', taking part in major folk festivals at places like Swanage, Evesham, Wimborne, and Rochester. We've danced in the United States, Brittany and Ireland. 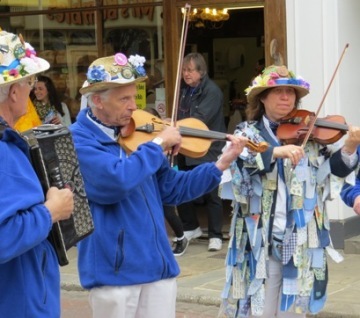 We teach groups, including scouts, schoolchildren, WIs and Rotary Clubs how to morris dance. We've danced at Hampton Court, Trafalgar Square, the Millennium Dome, on Portsmouth dock by The Victory and in Hurst's panto. We have both male and female dancers and we're of all backgrounds and ages. Currently, our youngest dancers are in their 20s and our oldest is, well, young middle-aged!? We have a superb band of lovely musicians who perform endlessly and tunefully for us as we practice and perform all year. We all get on really well and have even been on holiday together - with and without dancing!